Identify your flood risk globally with unrivalled precision. Our tools make it easy for clients to assess their exposure, mitigate against risk and respond to extreme events anywhere. We work with clients across a wide range of industries. They all have unique and specific problems that need to be addressed; from large insurers looking to analyse their risk across a large territory, to an NGO or government looking to assess flood risk from the national to local scale. If you’re a new user of flood hazard tools, we can help you to engage with the data making it as transferable and accessible to your needs as possible. We can provide point estimates of flood risk for any location in your portfolio. And if you have very specific needs we also provide tailored solutions that enable you to acquire specialised tools constructed using the best data and methods available. To meet the different needs of our clients, our products are formatted in a variety of ways. Categorised products, such as our underwriting tool are easy to interpret, so they can be used to make decisions quickly. Partitioning of flood hazard can be tailored to meet the specific requirements of the end user. Our flood hazard data have global coverage at 10 different return periods. These Expert level data provide flood depth values for the 5, 10, 20, 50, 75, 100, 200, 250, 500 and 1000 year events. Our Global and US products provide flood hazard data at ~90m and 30~ resolution respectively. In addition to these data, we provide bespoke modelling solutions down to the centimetre scale. Our group has pioneered research using highly accurate laser altimetry data enabling urban flood hazard models to be built at resolutions down to 50cm. Both fluvial and pluvial (flash-flood) perils are modelled. All river channels from large rivers to small streams are explicitly represented. The US Army National Levee Dataset is included. Data is provided with and without flood defences. All simulations are dynamic full 2D simulations. Fathom US has been peer reviewed in world leading journals. The US model was built using the US Government National Elevation Dataset, and has a 30m resolution. All simulations are dynamic full 2D simulations, undertaken using our bespoke 2D hydraulic modelling package. Our core computational engine is based on methods pioneered by the leading research-grade LISFLOOD-FP hydraulic model developed at the University of Bristol. It is driven using thousands of USGS river gauges and rainfall data from The National Oceanic and Atmospheric Administration. The data also includes the US Army National Levee Dataset. This nationwide database of flood defence is explicitly included within the model; all of the levees have an associated exceedance threshold enabling them to be included. This means that the Fathom US Defended data can provide hazard layers with the influence of flood defence levees being dynamically represented. CLICK ON the map to VIEW it with flood defences. Our Fathom US model has been validated against thousands of FEMA and USGS flood maps covering the breadth of the USA. Working with by researchers at the University of Bristol our US30 model was compared to flood maps produced by the Federal Emergency Management Agency and United States Geological Survey. FEMA’s expenditure on flood mapping to 2013 is estimated to be up to 7.5bn. Our flood models produced comparable results with greater coverage for a fraction of the cost. •	Our data attained a very high level of fit to FEMA flood maps, capturing over 80% of the flooded area specified. 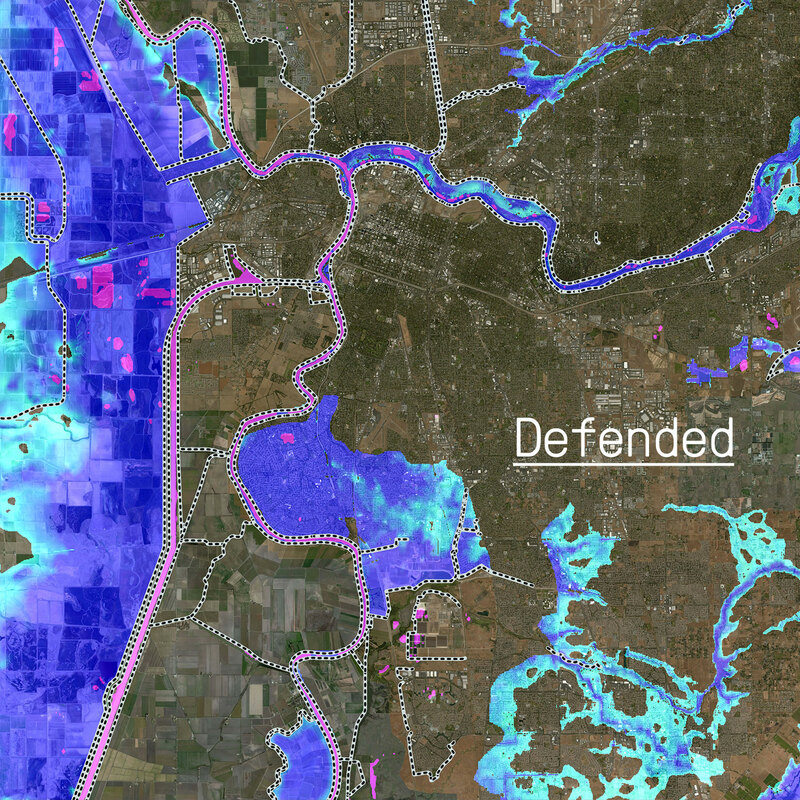 •	Compared to particularly high quality FEMA data our model replicated 86% of the specified floodplain. •	Relative to higher quality USGS models, our data captured up to 100% of the floodplain. Wing, O. E. J., Bates, P. D., Sampson, C. C., Smith, A. M., Johnson, K. A. and Erickson, T. A., Validation of a 30 m resolution flood hazard model of the conterminous United States. Water Resour. Res. Estimated Federal Emergency Management Agency (FEMA) expenditure on flood mapping up to 2013. Expert hazard layers at 10 Return Periods. Data is provided with and without defences. Categorised hazard data is easily accessible. Catchment specific analysis can be undertaken. Our Global hazard layers are based upon custom processed topography data, taken from the Shuttle Radar Topography Mission (SRTM). The Global map has a 90m resolution, providing both fluvial (riverine) and pluvial (localised rainfall) hazards. All simulations are dynamic full 2D simulations,carried out using our bespoke 2D hydraulic modelling package. Our core computational engine is based on methods pioneered by the leading research-grade LISFLOOD-FP hydraulic model developed at the University of Bristol. Following the release of NASA's new state-of-the-art Digital Elevation Model (NASADEM) we will be increasing the resolution of the Fathom Global Model to 30m in early 2018. Further developments of the global model such as the assimilation of remotely sensed river networks are also scheduled to be incorporated into our Global map. These developments will represent a step change in the capability of these models. Our Global map has been extensively compared to the Environment Agency’s Flood Hazard maps, in the UK. This data was produced by building bespoke engineering grade flood models nationwide. A comparison between this data and the Fathom Global data revealed that data captured between two thirds and three quarters of the area determined to be at risk without generating excessive false positives. When aggregated to ~1km, the absolute error fell to ~5%.